Adult Day Services offer a variety of health and social services in a protective group setting. 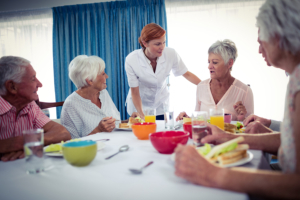 Necessary health, personal care and social services are provided for adults who do not need the continuous services of a nursing home or institutional setting and are able to leave their homes to come to the center. While caregivers work, do errands or just have a day to themselves, the day center participants are engaged in vital social and recreational activities. These activities help them stay involved in the world and with people around them. Individuals who participate in adult day services have the opportunity to meet and socialize with others and enjoy organized activities designed with their interests and abilities in mind. They are encouraged to try new activities and continue those they have always enjoyed.